MOTIVATOR (60 capsules) [MOT454] - $23.95 : CarboPro and Hydra C5 Ultimate Energy For Endurance Athletes, CARBO PRO manufactures the finest and the best nutrition supplements for Power Strength and Endurance Athletes. Based on the latest research and scientific findings. MOTIVATOR can be used by power, strength, and endurance athletes, or used during any prolonged activity for sustained mental energy and focus. * A large part of training and racing is MENTAL, its about brain energy and motivation. use if you are taking antidepressants, MAO inhibitors, or any other prescription drugs. *The statements on this label have not been evaluated by the Food and Drug Administration (FDA). This product is not intended to diagnose, treat, cure, or prevent any disease. 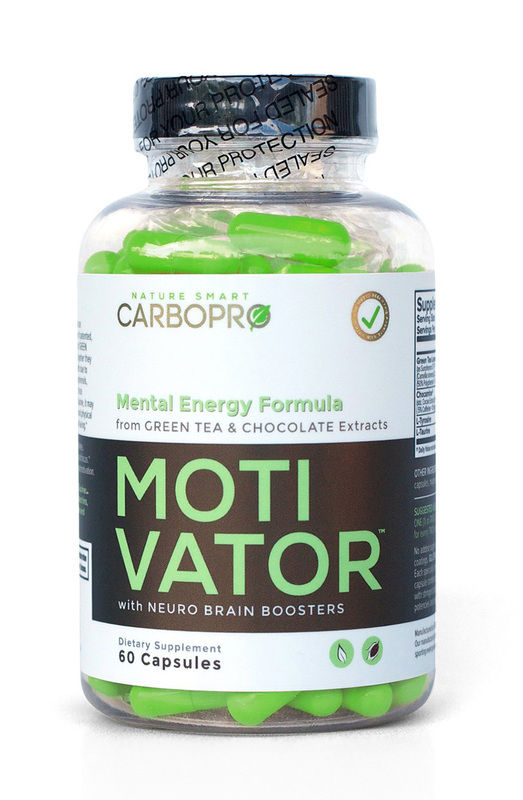 MOTIVATOR contains a scientific blend of thermogenic and energizing ingredients plus neurotransmitter precursors: Green Tea Leaves extract (22% Caffeine), Cocoa Extract (providing Theobromine), L-Taurine and L-Tyrosine. You can experience the synergy of these choice ingredients to Perk up before exercise, or fire up during exercise, or you may take it as a pick me up anytime for a blast of energy. Green Tea leaves extract is widely considered a superior antioxidant due to its high concentration of polyphenols, which are compounds that help destroy potentially harmful free radicals. MOTIVATOR’s Sunphenon C-FT® Green Tea Extract is incredibly pure and powerful, providing 98% polyphenols for maximum antioxidant support. It is well known that Green tea extract may also help support normal, healthy immune function. MOTIVATOR’s Green Tea Extract contains 45% EGCG, a particular polyphenol that may promote fat loss and support weight management by increasing energy expenditure. By increasing your overall metabolic rate, green tea can be used in combination with exercise to assist and increase fat-metabolism and provide energy for exercise activity in the process. Sunphenon C-FT® Green Tea Extract also contains 22% of natural caffeine which can help increase energy. The addition of caffeine to the potent mix of catechins revs up your production of noradrenaline, pumping you with enough feel-good confidence to take on tough tasks and terrains. 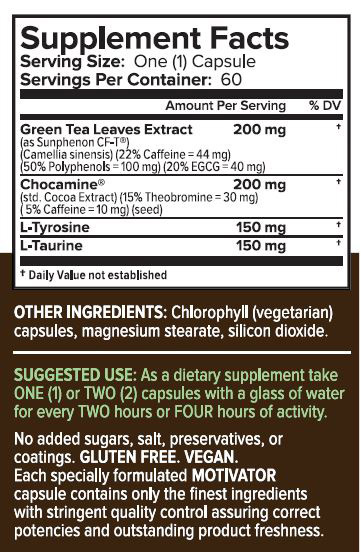 MOTIVAOTR provides 44 mg of Caffeine per capsule from green tea leaves extract (Sunphenon C-FT®). Numerous epidemiological studies show that regular consumption of green tea or its extract has a net positive effect on overall health. Even as a supplement, green tea can be a worthwhile addition to your dietary habits, especially if your goal is fat loss. The primary difference between drinking tea and taking it in capsule form is dosage which in supplement form is typically much higher. The second key ingredient in MOTIVATOR is Chocamine®, a potent, highly purified extract derived from the cocoa bean, which delivers amazing cognitive support, mood enhancement, appetite control and increased energy; all without the calories that would come from eating chocolate. Chocamine is the only patented and GRAS (generally regarded as safe) certified cocoa-based supplement that offers an array of amazing benefits due to its unique ingredient profile, rich in antioxidants, polyphenols, xanthines, anandamides, amino acids, and other trace nutrients. If you are looking for a natural way to energize the body, stimulate the mind, reduce cravings, and increase feelings of well-being, Chocamine will deliver impressive results. The powerful powerful antioxidants, trace amines, xanthines and anandamides in Chocamine work synergistically to increase alertness, enhance stimulation, support mood, and supercharge the body. One of the main components of Chocamine is Theobromine, a highly specific xanthine related to Caffeine, which delivers the same stimulant properties as caffeine, without the edginess usually associated with caffeine use. Chocamine delivers potent stimulation and powerful cognitive support, without the edginess or jitters associated with other energy products. L-Taurine is a free-form amino acid that participates in a variety of metabolic processes. Taurine is a neurotransmitter, a neuromodulator and is involved in glucose uptake. It's a component of bile acids, which are used to help absorb fats and fat-soluble vitamins. Taurine also helps regulate the heart beat, maintain cell membrane stability, and reduce brain cell over-activity. Taurine is found in meats, fish, milk and eggs, but not in vegetable proteins. L-TYROSINE: Tyrosine is an important amino acid that is a precursor to a number of neurotransmitters related to our feeling of well-being. A deficiency of these neurotransmitters will result in low moods and a reduced ability to cope with stress. Studies have indicated a marked increase in ability to deal with stress, as well as improved endurance to anxiety and stress under fatigue when supplementing with Tyrosine. Studies have also shown that Tyrosine supplementation results in increased performance while under stressful conditions. Besides helping with multiple other functions, Tyrosine is important because of its ability to convert to the mood elevating neurotransmitters, norepinephrine and dopamine, in the brain. Additionally, Tyrosine converts the thyroid hormone to adrenaline which is produced by the adrenal gland in response to stress. Supplementation helps in the process. Tyrosine improves motivation, drive, and concentration. A Study (Deijen JB, et al Department of Clinical Neuropsychology, Vrije Universiteit, Amsterdam, The Netherlands) noted that Tyrosine improves cognitive performance and reduces blood pressure in cadets after one week of a combat training course. Findings suggest that supplementation with Tyrosine may, under operational circumstances characterized by psychosocial and physical stress, reduce the effects of stress and fatigue on cognitive task performance.